Last Saturday, for the second week in a row I had signed up to do the new runners briefing and then tail run at Ellenbrook fields parkrun- I was going to do one but as they were short of volunteers and I can do both, it made sense. Just like last week I planned on getting there early and running a couple of miles, to get the total up to 5 miles. However when I got to the car park it was coned off (we have permission to use a University car park on Saturday mornings). As there were no cars I thought they had been left out, so I got out of my car to move one, and got shouted at by a man at the other end of the car park. Personally I felt he was quite rude- I explained that the runners have permission and he told me he was here to stop people moving the cones, so I would have to go to reception- he pointed but in fact when I drove around the corner it was in fact a dead end. Helpful. So I put a message on the parkrun facebook page, hoping that the RD would see it, and then I drove off, and as I knew the area I found a residential street to park in. This all took time, so in the end my leisurely two miles was rather frantic as I wanted to get my breath back before doing the briefing! I called everyone over at around ten to 9, like I was asked to do last week. 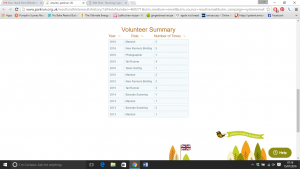 I had only tourists, no new parkrunners, which made it easier. Then the RD waved at me, I gave her the thumbs up and she announced I was about to do the briefing- I had to shout that I had already done it! I thought she was waving to check it had gone OK! I then had one new runner come over, which was probably good for them as she could ask me questions about the course and timings. It’s nice doing both jobs as I could reassure her that I would be at the back- it seems to be the main worry of most people. This time there was a girl running at the back who I chatted to- she had only been running since January and had run a couple of 10k’s, so we chatted a lot about races. It was all very enjoyable, and very speedy for a tail run- a few of the marshals told us we were very quick, and I think we got in around 42 minutes- very impressive! My watch beeped for 5 miles just as we finished which was perfect as that was what I was aiming for. I walked back to my car, changed into a t-shirt and then drove to my mum’s house. Mum was making pancakes for breakfast which is my absolute favourite, so we had a lovely breakfast and catch up, before they lent me their wallpaper steamer. After a quick shower at home, we started with the wall paper stripping (what do you call it? Because we aren’t decorating. we are anti-decorating…). The steamer could only be used for 80 minutes as then it would overheat, so we left it for a bit and watched some tennis. 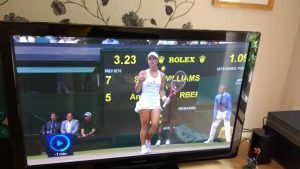 Mum had told me that Dad was down to do the ladies final at Wimbledon (he does the line judging there) and so I was trying to spot him- he was at the end opposite to the main cameras but I did catch a glimpse of him at a couple of points, and when they give the trophy they all line up at the end. We only managed to strip two walls as in the afternoon we were off to see Andy’s brothers, but we are in no rush and will carry on next weekend. I was looking at my parkrun profile later on, and I am sure I have earned my purple shirt, but I have not had the email yet. Ah well. This weekend I am marshalling so I might borrow something from work again- not sure it will be a tambourine again. Any suggestions?